To generate your Certificate Signing Request (CSR), you will need to log into your server and use the following instructions. If you are generating a CSR to renew a certificate, or a CSR for a site that has an existing certificate, please see the notes at the end of this article. 1. Log into the server. 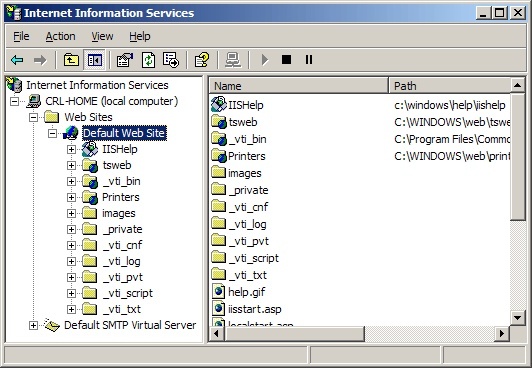 Go to Control Panel > Administrative Tools and double-click Internet Services Manager. 2. Right-click the website where you require the CSR and choose Properties. Select the Directory Security tab. 3. Click the Server Certificate button. A wizard will start. Choose the option to Create a new certificate, then click Next. 4. Click Prepare the request now, but send it later, then click Next. 5. Enter your information. 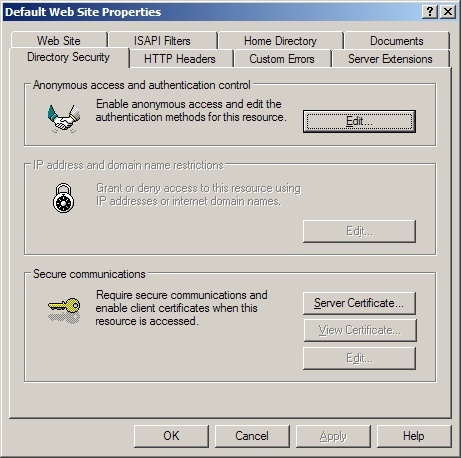 The Name refers to a Friendly or Descriptive Name for the certificate, and is not your domain. Set the bit length to 2048, then click Next. 6. Enter your Organization and Organizational unit information, then click Next. 7. Enter the fully qualified domain name of the website where you require the certificate. For wildcard certificates, enter in the format *.mydomain.com, then click Next. 8. Enter your location information, then click Next. 9. Choose a path and filename to save the CSR, then click Next. 10. Review the information. Click Next. Your CSR is now generated. 11. Open the certreq.txt file with a text-editor and copy and paste the contents into the enrollment form when requested. You have generated your CSR for Microsoft IIS 5.x/6.x. Note: If you are generating a CSR for a renewal of a certificate, step 3 should have an option to renew the certificate and generate a new CSR. Select this and follow the wizard through to create a renewal CSR for the certificate. The CSR generation process creates a Pending Request on the website. Do not remove this pending request. 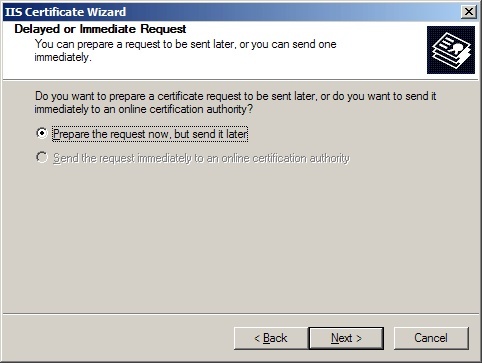 The request completes once you receive and install the certificate. Removing the Pending Request before you have installed your certificate will render the certificate useless, and you will need to repeat the entire CSR generation process again, and re-submit the CSR to us. How Do I Generate a Certificate Signing Request for cPanel or WHM? How Do I Generate a Certificate Signing Request for Parallels® Plesk? How Do I Generate a CSR for Apache with mod_ssl and OpenSSL?